In high school she took as many art classes as possible, especially enjoying cartooning and advertising design. Lisa Lewis attended several colleges with courses that range from drawing, art therapy and later film making and B&W photography. In the early 80's she lived in Nyack, N.Y.(on the Hudson River) where she studied live model drawing and abstract painting at the Hopper House, former home to the artist Edward Hopper. In Nyack she showed her work in local restaurants. After moving to south Florida she received her Bachelor’s degree in Fine Arts with Art Teaching Certification from Florida Atlantic University in Boca Raton in 1998. Presently she has been showing and selling her artwork in Palm Beach and Broward Counties and plans to continue studies in the Fine Arts. Lisa Lewis’s non-traditional approach to picture making marks her as a contemporary artist/painter who thinks outside the box. Working primarily through imagination, she creates images that show roots in reality that often appear as part of a fantasy landscape. "I want the image to jump out from the canvas" , in doing so it transcends the picture plane and becomes interactive with the viewer. 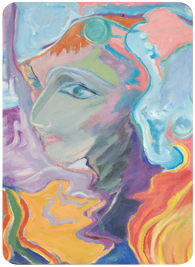 "I suppose that the only way to express the sentiments, dreams and visions is to express them visually, exposing and sharing them in a picture"
In composing a painting, Lisa states "I think of variation and theme, more in the forms, marks, and hues being applied than in the literal meaning of the finished image". The beauty of life is so intense that rather than trying to duplicate it, I paint from my imagination ----- what could be, or perhaps catching and releasing the essence of something interesting and beautiful. You may see more of Lisa's work on her LULA artist profile page.